Feline infectious peritonitis (FIP) is a serious and most often fatal disease affecting cats. It is most commonly seen in young cats between the ages of six months and two years. It has been found to affect male cats more commonly than females and purebred cats particularly the Asian breeds are more susceptible. It is characterised by fluid build-up in body cavities such as the chest and abdomen and neurological signs. It can affect all major organs and inevitably results in death. It may be referred to as Feline coronavirus polyserositis (wet or effusive form) or granulomatous feline infectious peritonitis (dry or non effusive form). FIP is caused by the Feline Corona Virus (FCoV). The Feline Corona Virus is commonly found in the environment and many cats may be carriers or infected with the Feline Corona Virus although only a small percentage may develop FIP. The Feline Corona Virus is more commonly found in multi cat households and catteries than in homes with less than five cats. The Feline Corona Virus occurs in the cat’s intestinal cells. In some cases, it spontaneously mutates from a benign, and minimally pathogenic (meaning that it is hardly harmful) virus to a lethal killer. No two cats are infected with exactly the same virus as there are many different mutations and the mutation depends on the cat’s immune response. 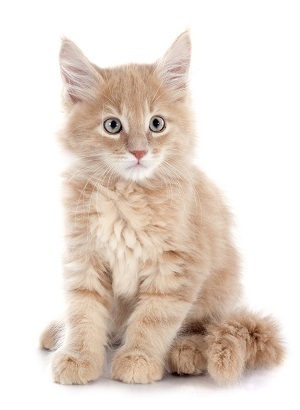 Feline Corona Virus is mainly passed on by contact with an infected cat’s stool. It may also be passed on from a queen to her kittens during pregnancy. Humans can also play a role in transmission as the virus can be carried on clothes, shoes and food bowls for a short period of time. Stress in cats may increase the risk of contracting Feline Corona Virus. Vaccinations, elective surgery, a new home and inadequate nutrition may all play a role. The Feline enteric Corona Virus causes self-limiting diarrhoea in cats. This means the disease usually clears by itself, without requiring treatment. FIP is the virulent mutation and is fatal. Feline Corona Virus has a spectrum of symptoms. It ranges from cats becoming non-carriers and completely clearing the virus to cats developing life-threatening FIP. There are two main forms of FIP that have been described. The first is the wet or effusive form, which is characterised by the build up of fluid in different body cavities. The second is a dry or non-effusive form, where cats develop granulomas or masses in organs such as the kidneys, lymph nodes, brain and eyes. Many cats present with non-specific signs such as lethargy or weakness, poor appetite and weight loss as well as a cyclical fever (where the animal’s temperature goes up and down). There may be a history of stunted growth or the cat repeatedly being on antibiotics. Cats with the wet form of FIP may have difficulty breathing or have a swollen tummy due to the accumulation of a thick yellow fluid in the chest or abdomen. Cats with the dry form of FIP develop signs associated with the occurrence of masses in particular organs. These signs may include cloudy eyes, seisures and other neurological signs such as changes in behaviour. Watery stools are seen only occasionally and some cats may become jaundiced with a yellow discolouration of the gums, the eyes and the skin which can be seen most clearly on the inside of the ears. FIP is a disease where the confirmation of the diagnosis is difficult and many times the disease can only be confirmed 100% if the animal has died. One of the reasons is because the initial stages of the disease looks very similar to and needs to be differentiated from the more common and usually harmless Feline Corona Virus. The diagnosis is based on a combination of non-specific and specific clinical signs as well as a compatible history, age and breed of the cat, indications of possible exposure different diagnostic tests. Seeing as there is no definitive test as for some other viral diseases, it can be quite a challenge to rule out other possibly diseases. In the wet form of the disease, the fluid can be tested which makes the diagnostic process easier. Sometimes the only way to make a definitive diagnosis on a living animal is to surgically sample organs such as the intestines under general anaesthetic. Blood tests, X-rays, an eye and neurological exam will help narrow down the diagnosis but unfortunately cannot confirm the diagnosis one hundred percent. What is the prognosis once a diagnosis is made? Sadly, FIP is a disease which cannot be cured and more often than not results in death. If a cat has been diagnosed with the wet form, one can expect a two-month survival. The dry form may have a more chronic course, but in most cases is still fatal. FIP cannot be cured. Once a cat has been diagnosed, it is managed symptomatically and supportively. Euthanasia may often be the kindest option. With the wet form, the fluid may need to be drained from the chest or abdomen. The cat may need oxygen. They are often dehydrated so will need intravenous fluids. Immunosuppressive drugs such as corticosteroids and antiviral drugs may be prescribed, but the success of treatment is usually poor. The cat may often require long courses of antibiotics to prevent the occurrence of secondary infections. Environmental management plays an important role in supportive therapy. This includes reducing stress and ensuring that the cat has a safe place to sleep and hide. Nutritional support is also important and includes things such as feeding soft food, warming the food and possibly hand feeding the cat. Once the disease becomes debilitating and weight and appetite decline, one should be prepared for the inevitable and strongly consider euthanasia as dying from FIP does appear to be painful. In order to prevent FIP, one needs to try and prevent infection with Feline Corona Virus, which is nearly impossible. The good news is that not all strains of corona virus cause FIP, but reducing the transmission is still important. There is a vaccine available but it has not been found to be very effective. This is due to there being so many variations in the mutation of Feline Corona Virus and unfortunately these mutations are very difficult to predict. Keeping cat numbers down in a household remains an important control method. It has been found that households with fewer than five cats are less exposed to contracting Feline Corona Virus and they tend to clear the infection quicker without being re-infected. In shelters and breeding catteries this becomes more difficult. An early weaning practice has been suggested in breeding colonies, where the queen is separated from the rest of the group one to two weeks before she gives birth. The kittens are weaned early at five to six weeks and kept isolated from the rest of the colony. In shelters, transmission is lowered where cats are kept separately but again this is not always possible as space is often limited and the virus is carried on clothes, feed bowls and cleaning equipment. The levels of Feline Corona virus may be decreased by general cleanliness, fewer cats and cleaning the litter boxes frequently. If a cat has been diagnosed and died, one should try and wait three months before getting a new cat as the virus can survive in the environment for a short period of time. In multi cat households, this is difficult, as most cats would have been exposed to the sick animal before it was diagnosed. FIP remains a challenging disease to manage as it is difficult to diagnose, there is no cure and it is easily transmitted between cats in the form of the non-mutated Feline Corona Virus. Keeping cat numbers down remains an important method of control as well as allowing an adequate waiting period before introducing a new cat into a household.